The first commercially produced hose pumps were introduced in 1956, and many design improvements have been made along the way. Unlike earlier pumps, peristaltic pumps have no valves, seals or glands and the fluid being handled only contacts the bore of the hose or the tube. As recently as ten years ago, peristaltic pumps were only sparsely found in water and wastewater treatment facilities in North America. This was primarily due to limitations with hose/tube design as well as pump capacity for both low and high flow applications. In the past, the fundamental problem in applying peristaltic hose pump technology to environmental applications was the development of a hose element that could accommodate continuous duty and required flow rates, along with the ability to handle highly abrasive and chemically aggressive fluids demanded by environmental processes. Unlike other positive-displacement (PD) pump technologies, which have tight tolerances or interference fits of the wetted rotating parts, peristaltic pumps keep extremely corrosive chemicals, such as ferric chloride, sodium hypochlorite, and abrasive fluids, such as various sludges, lime and powdered activated carbon (PAC) slurries, from wearing the pumps rotating components. In fact, a properly selected heavy-duty pump hose does not fail due to abrasive wear; it only fails due to the total number of occlusions seen in a specific application. Regardless of product, whether it is abrasive grit in a grit removal system, thickened sludge, lime slurry or nonabrasive polymer, the hose life is the same. This is mainly due to the hose pump design being a truly positive displacement pump that does not incur slip. As such, a hose pump is a 100 percent volumetrically efficient pump technology where flow is independent of pressure. 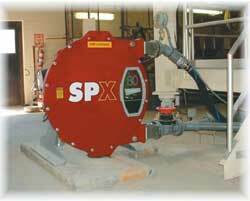 All peristaltic pumps are inherently sealless pumps. There is no packing or mechanical seal that comes in contact with the pumped fluid. This is especially convenient from a housekeeping perspective, as there is no potential for sludge leakage. It is also an important safety feature when pumping dangerous chemicals as the possibility of emissions leaking from a seal box is eliminated. All peristaltic pumps have the ability to run dry without damage. This prevents the pump from vapor locking and causing catastrophic failure to the pump itself. This is especially true when pumping liquids that contain air such as in dissolved air floatation sludge (DAF) or when a chemical emits an off gas such as with sodium hypochlorite. There is no better self-priming pump design than a peristaltic pump, which based on pumping water, can achieve up to a 31-foot suction lift. When pumping chemical through the top of a 55-gallon drum, or lifting sludge from a deep sump, a peristaltic pump will out perform other PD pump technologies. Most peristaltic pump designs are also reversible, allowing for instantaneous back flushing of lines. The pump remains 100 percent volumetrically efficient in either direction. Peristaltic pumps provide a gentle flow, which is ideal for pumping viscous polymers where shearing is undesirable. Unlike other PD pumps, peristaltic pumps are contamination-free. Since the liquid is completely contained within the tube/hose, there is no contamination of the pump or pumped fluid. A major advantage of tubing pumps is the ability for up to seven different diameters of tubing to be used with the same pump head without resetting any aspect of the head/roller assembly itself. This means the turn down capability of a single tubing pump can be as much as 27,500:1. This is achieved by using the largest diameter tube with the pump running at full speed and then switching to the smallest diameter tube while operating at minimum speed. It is literally like having seven different sized pumps in one small unit no larger than the size of a breadbox. Tubing pumps are virtually silent in operation and do not vibrate. The fractional horsepower robotic grade servo motors utilized in many peristaltic tubing pump designs use much less power than comparably sized diaphragm pumps that require much larger external motors. There are two basic groupings of environmental applications for peristaltic tubing and hose pumps: chemical metering and sludge feed/transfer. There are a myriad of chemical metering applications found in a water and wastewater treatment facility that are well suited for peristaltic pumps. The most common include sodium hypochlorite, sodium bisulfite, ferric chloride and various polymers. Depending on the level of treatment in a plant, there can be varying types of sludge created as a byproduct of the treatment of wastewater; the type of sludge is determined by the treatment process and the chemical composition of the wastewater. Peristaltic hose pumps are used for feed and transfer of applications including, thickened sludge, waste activated sludge (WAS), return activated sludge (RAS) and grit removal. A major advantage of peristaltic pump technology is the reduction of ancillary equipment required in a chemical or sludge pumping system. The capital, installation and maintenance costs of this extra equipment must be added to that of the pump/motor to provide a true life cycle costs (LCC) for the entire pump system. In addition, with tubing pumps, flowmeters are often eliminated, as the accuracy of the peristaltic pump is usually superior to that of the flowmeter itself. Occasionally, peristaltic pumps require the use of inexpensive pulsation dampeners. This is not a function of the pump, rather a function of the suction & discharge pipe length and diameter. Approximately 1 percent of tubing pump installations and 35 percent of hose pump installations incorporate dampeners. These dampeners effectively remove 98 percent of trace pulsation. The two major categories of peristaltic pumps are hose pumps and tubing pumps. Improvements in direct coupled (not closed coupled) bearing design and heavier duty casing designs have led to the next generation of hose pumps. These pumps reduce the total number of parts by one third, while providing the user with even better performance and reliability. Hose replacement has never been easier or faster. In addition, capacities have increased to 350 gallons per minute (gpm) while the footprint of dual-headed hose pumps has reduced in size by almost half. This is truly a small footprint for such high flow. Advancements in tubing materials are allowing pressures to reach 100 psi with continuous service. This is a perfect match for injecting small amounts of chemical into a pressurized water line. Improved pump head design allows for built in leak detection upon a rare tubing failure, while keeping the chemical safely contained inside a sealed head. Further improvements in electronics also allow the user to manually trim the pump speed while operating off of a remote input signal. Further, enhancements in output signals eliminate the need for separate signal control boxes. By achieving the lowest life cycle cost, peristaltic tubing and hose pumps are now a popular PD pump technology in the environmental marketplace. There are now tens of thousands of peristaltic pumps installed throughout the world.